New Delhi: Union Minister of Commerce and Industry, Suresh Prabhu, said that for achieving the development objectives of growth with equity that will transform Indian society. It is essential to encourage women entrepreneurs. 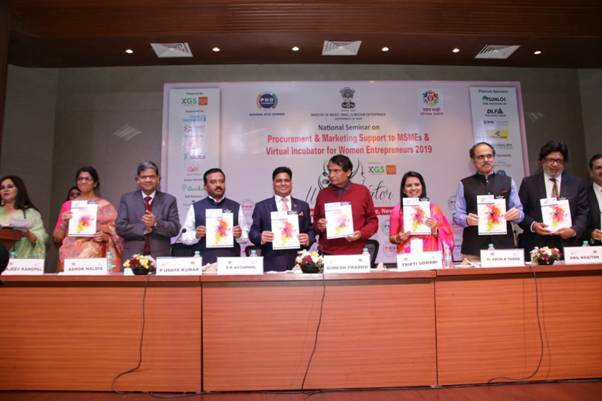 Suresh Prabhu was addressing a National Seminar on procurement and marketing support to MSMEs and the launch of Womennnovatorson the occasion of International Women’s Day in New Delhi today. Commerce Minister said that the rising numbers of female business owners is a global trend specially in developing countries. The Minister said that women should be given the freedom to do what they can do and what they want to do. Suresh Prabhu further said that the Government of India has taken a number of initiatives to strengthen the ecosystem for women entrepreneurs. Women specific initiatives includes identifying and awarding women, providing knowledge and skills, mentoring and networking, incubation and accelerated support and international exposure to women entrepreneurs. Government of India is committed to enact policy, physical regulatory and other support measures for skill development, innovation and entrepreneurship training at all levels including rural and semi urban areas. The Commerce Minister also referred to one of the important initiatives that is bringing together key stakeholders on the national procurement portal of Government e-Market (GeM) place. Since its inception more than 13 lakh orders worth Rs. 19000 crore has been processed in GeM. He informed that GeM is launching a dedicated section on its platform for woman entrepreneurs. Suresh Prabhu said that 103 airports will also have GI stalls for GI products which are mainly manufactured by women artisans. Speaking on this occasion, Secretary MSME, Dr. Arun Kumar Panda, spoke about the various schemes of the Ministry and requested MSME associations to inform members about these schemes. Dr. Panda mentioned 12 historic announcements made by the Prime Minister regarding the MSME sector. He said that all CPSEs are mandated to procure at least 3% of their requirements from women entrepreneurs.